YAKUSHIMA, KAGOSHIMA PREF. - There are gasps as the sand starts to move and a tiny black form breaks the surface. We’ve been hunkered down on the dark beach — completely still in the muggy heat for what seems like hours — and the reaction is equal part relief and amazement: Our wait to see loggerhead turtles hatching on Yakushima is over. The hatchling, alternating between thrashing violently and resting, eerily still, takes an agonizing length of time before it frees itself from the sand. Having escaped its bonds, it is soon followed by a sibling. More and more arrive in quick succession, piling on top of each other and exploring their new surroundings. 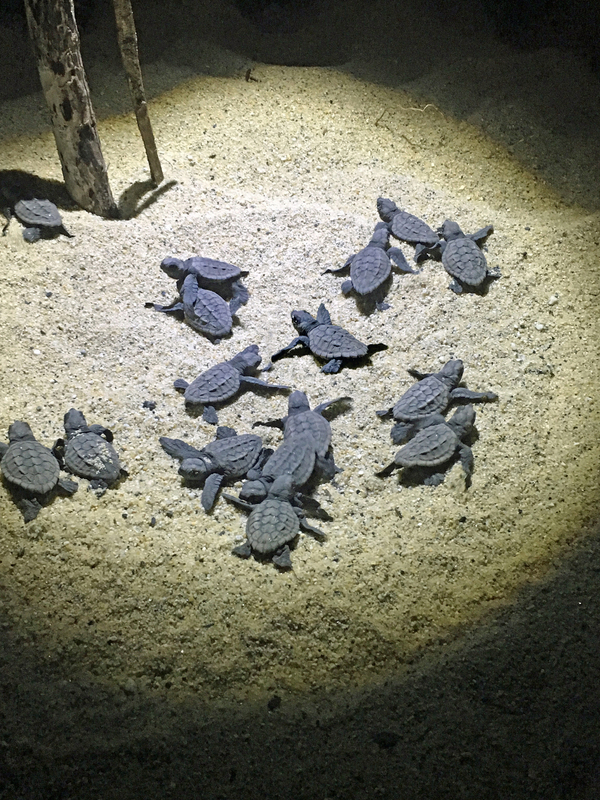 Soon, about 30 young turtlets are circling the illuminated hatching point; the light from our guide’s lamp acts as a fence, keeping them grouped together. When the last reaches the surface, the light is turned off and the hatchlings head instinctively for the sea, as the experts use torches to guide any that are struggling. Classified as endangered on the IUCN Red List, the species is much in need of this helping hand on Yakushima, a critical habitat for the turtle. Japan is the only area in the North Pacific where loggerheads lay their eggs and about half come ashore to do so on Yakushima. Some 90 percent choose Nagata Inaka Beach on the northwest of the island, where representatives of Yakushima Umigame Kan (a nonprofit organization monitoring and researching the turtles’ ecology), the Nagata Sea Turtle Liaison Council and the Nagata Beach Sea Turtle Conservation Association are working to boost the rates of egg laying and successful hatching. Much has been achieved. Historically, loggerhead turtles and their eggs were eaten or sold by Yakushima residents until the 1980s, when the island’s reputation for turtles resulted in growing numbers of visitors to taste turtle-related cuisine. In June 1988, Kagoshima Prefecture established the Loggerhead Turtle Protection Ordinance to protect landing sea turtles and their eggs. With penalties in place for those who did not adhere to the law, the number of turtles landing on Nagata Inaka Beach grew in 1990 and in 2008 rose more than threefold on the previous year, according to research by Yakushima Umigame Kan.
Prospects are looking up for the loggerhead but, 30 years on from the ordinance, volunteer groups are encountering a new threat: tourism. In 1993 — when Yakushima became a World Heritage site — tourist numbers began to rise significantly and, according to Yakushima Umigame Kan, sea turtles have been “increasingly obstructed from landing and laying eggs,” while hatchlings are “more frequently stepped on and killed,” albeit accidentally. Teams now work day and night during the laying and hatching season that runs from May to August to support official, expert-led tours and ensure visitors don’t cause disruption to the turtles. Volunteers dig up and replant nests in higher parts of the beach, cordoning them off with fences to avoid trampling. At night, they deliver sessions on turtle conservation before running official observation tours and leading the hatchlings to the sea. “It’s exhausting work,” said Kazuki Iwasaki, one of the volunteers who was monitoring the hatching sites when we visited in the afternoon. He was heading home to get a few hours of sleep before returning to work that night. “There aren’t enough volunteers, but it’s important that the turtles are protected; that’s what keeps me going,” he explained. Work is underway to improve the physical environment, too. Volunteers carry out regular cleanups and add sand to the beaches to make it easier for females to lay eggs. Trees have been planted along the top of the beach to reduce light pollution from passing cars, which can disorientate both laying and hatching turtles. There have also been awareness-raising activities, including with domestic and international tourists, school children and residents, on how to use the beaches safely during the laying and hatching seasons. As the number of tourists keen to witness turtles’ laying and hatching continues to grow, conservationists are tasked with ensuring their trips help rather than harm the turtles’ plight. Standing at the shore, on the instruction of our expert guide, the hatchlings’ slow journey over the sandy expanse exposes their vulnerability but, as they hit the waves, we see that they are designed perfectly for the water. And, thanks to the combined efforts of volunteers and professionals, they are one step closer to reaching adulthood. 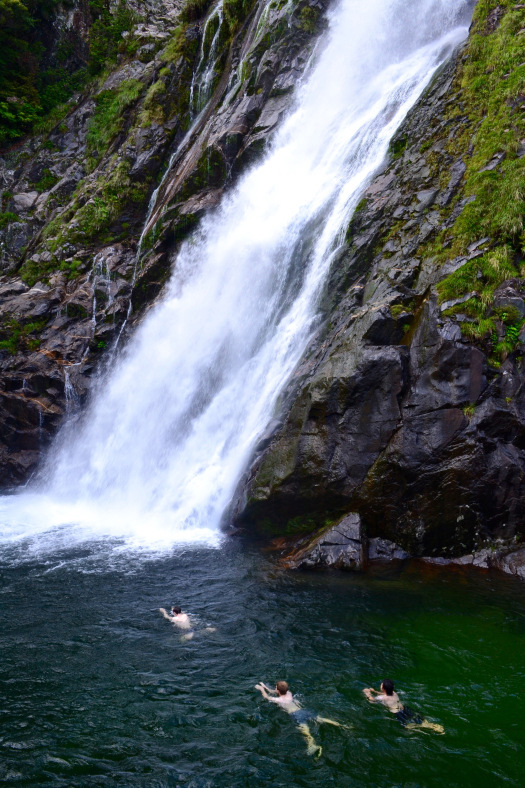 With annual precipitation among the highest in the world, at an average of over 4 meters per year over the lowlands and as much as 10 meters per year in its mountainous interior, Yakushima is the wettest place in Japan. This climate, in combination with tall mountains and powerful rivers, makes the island ideal for hydroelectricity generation. Currently, over 30 percent of the islands energy is generated at one of the island’s four hydroelectric plants, and the island’s electricity is produced entirely by renewables. The municipality has also made a commitment to become fossil fuel-free between 2020 and 2030, replacing imported fuels such as gasoline and diesel with island-generated energy. To that end, the municipal government has partnered with both Mitsubishi and Nissan to expand the availability of electric vehicles and charging points across the island, prompting a shift away from fossil fuels. In doing so, the island hopes to become a case study in creating a zero-carbon society. 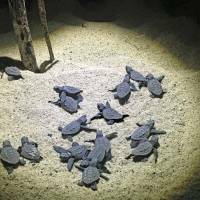 During hatching season (May-August) Nagata Inaka Beach is off-limits to visitors from 7:30 p.m. to 5 a.m. Tours can be arranged through Nagata Sea Turtle Liaison Council at nagata-umigame.com (Japanese only) or Yes Yakushima at yesyakushima.com (in English). 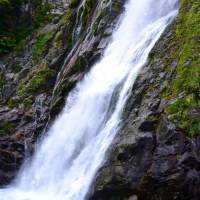 Yakushima can be reached by Jetfoil and ferry from Kagoshima Port. The island is served by several airlines, which connect Yakushima Airport to the rest of Japan.